Until I get them and have a play I will use some samples I have already done, these are of a couple of ATCs I have made for the Clarity Monthly Challenge...I have to admit this format has never appealed to me in the past. I think it is because I feel I am too clumsy to 'do' tiny but Clarity's miniture stamps make it easier. 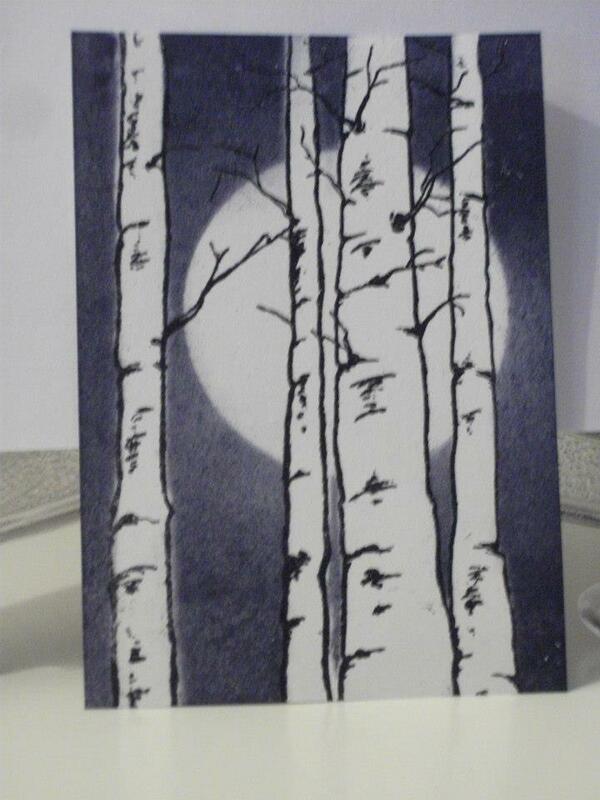 January's subject was 'Trees are green ...or are they' I remembered I had the lovely Clarity Silver birch stamp (this challenge is fun too because I am revisiting all my old stamps) I then had to work out the masking for getting the moon and the background in all good fun !! 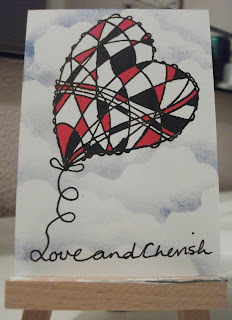 February's subject was Love & Cherish, well I haven't got endless heart stamps so I was stuck but then I remembered I had Clarity's 'Wired heart' stamp (I had bought it because my granddaughter Rhiannon was taken with Barbara's Zentangle technique). I still didn't know how I was going to use it .... but the angle I stamped it at reminded me of a balloon flying above the clouds ... so mask on and I dabbed clouds in background. I wanted to add the title and that's when I remembered Barbara freehand writing into a border she had drawn. This was nerve racking for me because I hate my handwriting but I just went with it ... and I was quite pleased with the end result. these are beautiful! I absolutely ADORE the 'love and cherish' one; it's perfect in every way! I can imagine it as a chick-lit book cover or as a repetitive image for valentines merch!